The pic is from ar15.com, and was made for a joke. 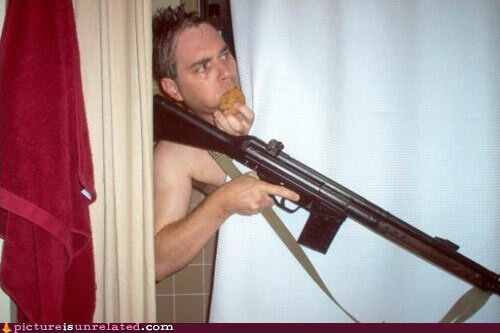 The thread title is something like "I was taking a shower and enjoying a chocolate chip cookie when…"
It's a classic on the site :) There is another image in that thread of a Glock pistol and a spare magazine vacuum sealed to a coat hanger, hung from the shower head. Of course, neither were serious.